"Our Obstetrician gave us a brochure for Cell Care. We had not previously heard of the availability of cord blood and tissue storage and felt it was something we wanted to do for our baby and her potential siblings. 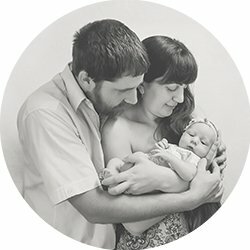 We had suffered 3 miscarriages and wanted to do everything in our power to ensure that our baby's health was protected for now and in the future. My niece had cancer a few years ago, and my husband's nephew was recently diagnosed with diabetes and the option to store our baby's stem cells felt like something we needed to do. As technology improves and medical research advances, there could be many applications of stem cells to improve our [baby’s] health in years to come if she should require it. The Cell Care website and introduction packs were very informative and helped us to make our decision. Our Obstetrician was able to do the collection so Cell Care staff were not required at the birth. The cord blood and tissue were picked up by Cell Care the next day, it was very straight forward and required little involvement from us as parents other than a simple phone call from my husband to let Cell Care know that the [kit] was ready to be collected. If you have a history of family illness or you feel that this is something you want to do for the future health of your baby if needed, seriously think about cord blood and tissue storage. As parents it made us feel like we have a little insurance policy in place, for those things in life that you don't plan for. Your [baby’s] cord blood and tissue can be stored for 25 years and is only available for collection once in a lifetime...at birth." Jody Dodds, QLD, November 2017.